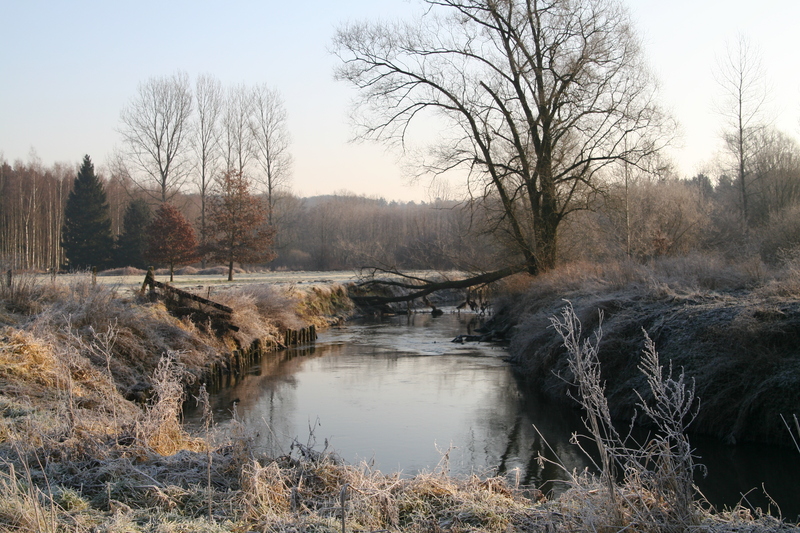 The Dijle (Dyle in French) is a 86-km long river running through the centre of Belgium. Its source is in Houtain-le-Val, near Nivelles in Walloon Brabant, and it ends just south of Antwerp in Rumst. This is when it meets the River Nete which 12 km further on flows into the Scheldt, on which Antwerp is located. Living in the centre of Belgium, on my walks and cycle rides I’ve often crossed the Dijle. I thought it would be interesting and useful to collate a few of these walks/cycle rides. Here is a map of central Belgium with the Dijle shown in blue and the places indicated that I mention in this post. I include this so you know roughly where all these places are. Let’s start in Wallonia, close to the source of the Dijle near Nivelles. The GR 121 long-distance footpath continually hops from one side of the Dijle to the other. However, it’s more of a stream in this area. Read about the walk here. Moving on north – downstream – Florival railway station is a good starting point for a country walk. You’ll be able to see the Dijle at various points of this walk, although it’s still narrow enough to jump from one bank to the other – just. Here‘s a description of this walk should you want to follow in my footsteps. A bit further on in Saint-Agatha-Rode the river begins to broaden out and look more like a river. There is a very pleasant walk along the Dijle in this area, and the village is worth checking out too. Read my walk here and discover the story of Saint Agatha. Not surprisingly, the Dijle is an important habitat for all kinds of flora and fauna. Nowhere is this more true than around Neerijse, and especially in the Doode Bemde nature reserve, where you can find evidence of beavers. Read an account of my walk along the Dijle in this area here. By the time the Dijle reaches Aarschot it has become wide and slow-moving. From Aarschot onwards, the paths on either side of the river are excellent for walking and cycling. Join me here as I report on my cycle ride along the Dijle from Aarschot to Werchter. My most recent encounter with the Dijle was a walk between Haacht and Hever. I took the bus to Haacht, found the Dijle, walked for 8 km along it, came off at Hever and took the bus back through Haacht and home. We say goodbye to the Dijle just before it flows through Mechelen. A good place to walk alongside it is the Mechels Broek nature reserve. You can walk around the reserve, visit a few bird observation hides, and then return along the river. Read about it in this post. Soon after leaving Mechelen, the Dijle enters its 86th kilometre, merges with the Nete, and disappears. 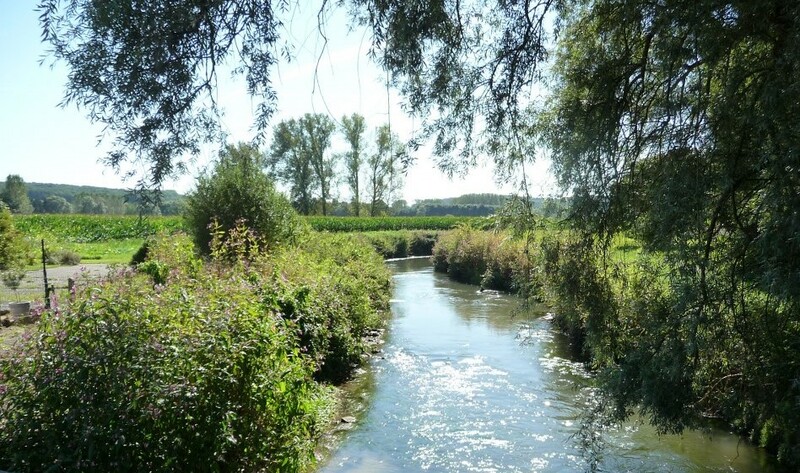 I hope you have enjoyed my little introduction to the River Dijle. And I hope it inspires you to walk or cycle along this fine Belgian river. Looks like it would be a gorgeous ride in any season. Yes, although I must admit Carrie that once I was cycling along the river in a freezing cold easterly wind. It was painful! I was expecting to see an iceberg with a polar bear on it come floating downstream! Haha, true. Icy temps would not be much fun. How is the book going Carrie? The countryside is so flat! This is my favourite type of walking.